Sinpo South Shipyard: Preparations for a New SLBM Test? Recent media reports indicate that North Korea’s sole SINPO-class experimental ballistic missile submarine (SSBA) has been engaged in “‘unusual deployment activity’ over the past 48 hours,” sailing approximately 100-km out into the East Sea (Sea of Japan). If correct, this would be the submarine’s longest known voyage to date. Most previous voyages have been far shorter and within the waters near its home port at the Sinpo South Shipyard. A 100-km voyage would also likely place the submarine in international waters—a first for the vessel. While there are several possible explanations, the most likely is preparations for a test in the near future of an updated Pukguksong-1 (KN-11) submarine-launched ballistic missile (SLBM) or a potentially newer system. 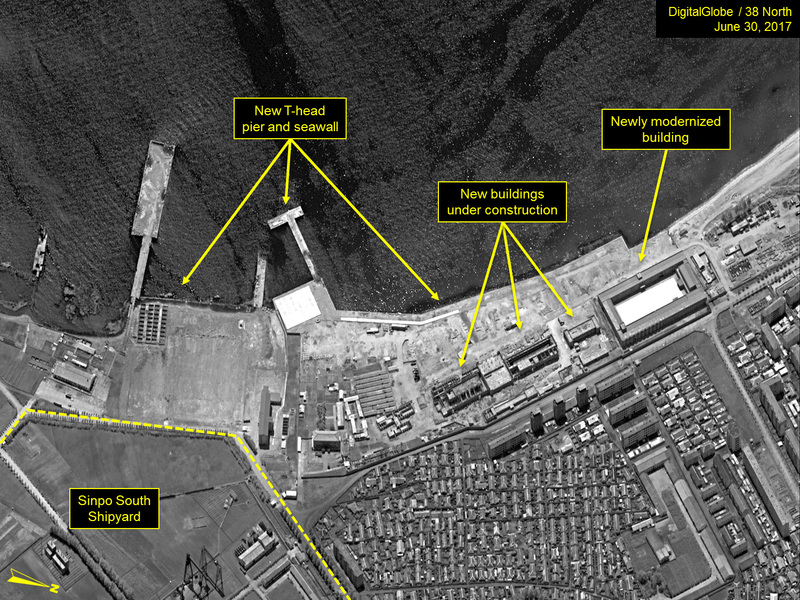 Commercial satellite imagery from June 30 of the Sinpo South Shipyard shows activity at the facility’s secure boat basin, where both the SINPO-class submarine and the submersible test stand barge have been repositioned. 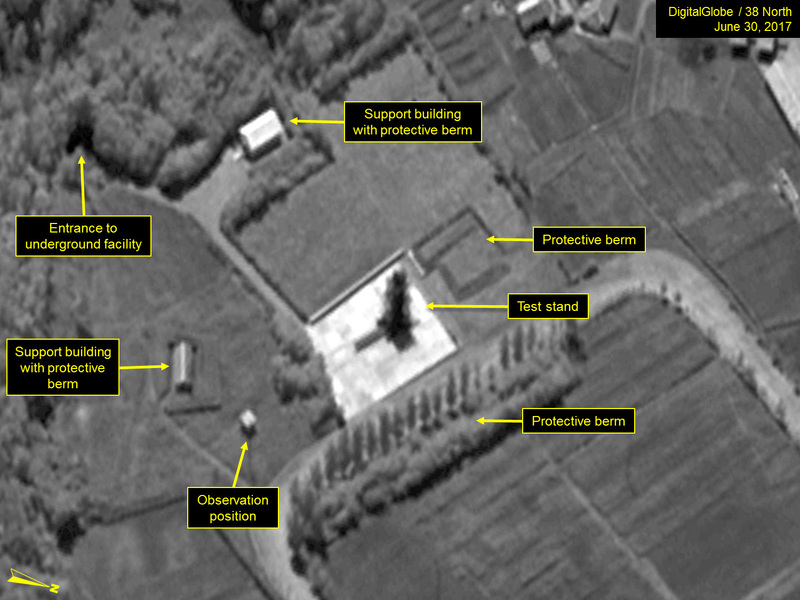 While the precise reason for this movement is unclear, one possibility is that it may have been long-term preparations for the recently reported voyage or an upcoming missile test. 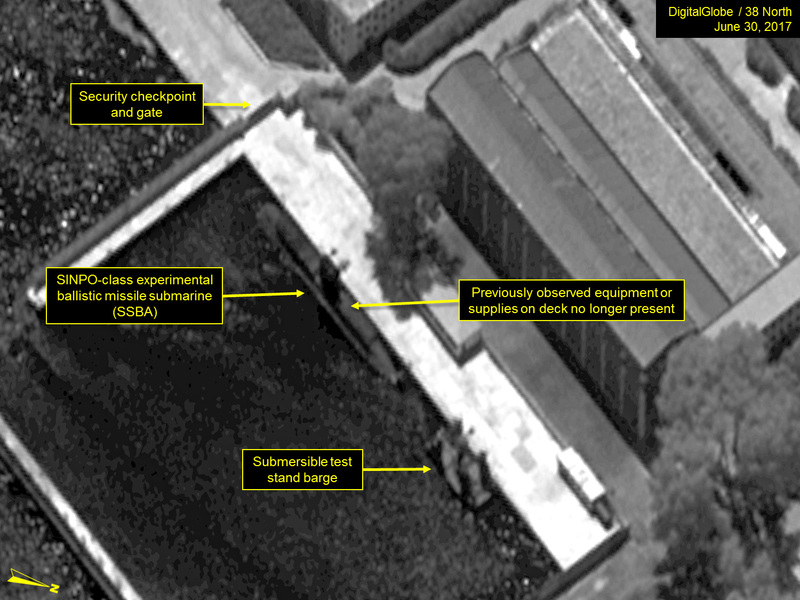 Imagery from June 30 indicates that the SINPO-class submarine was repositioned forward along the dock and the submersible test stand barge was moved from its position along the south pier enclosing the boat basin and berthed along the dock aft of the submarine. Both had been in their former positions since December 9, 2016. The June image also showed that the equipment previously positioned on the deck of the submarine, aft of the conning tower, were no longer present, suggesting that ongoing repair or modification work had been completed. 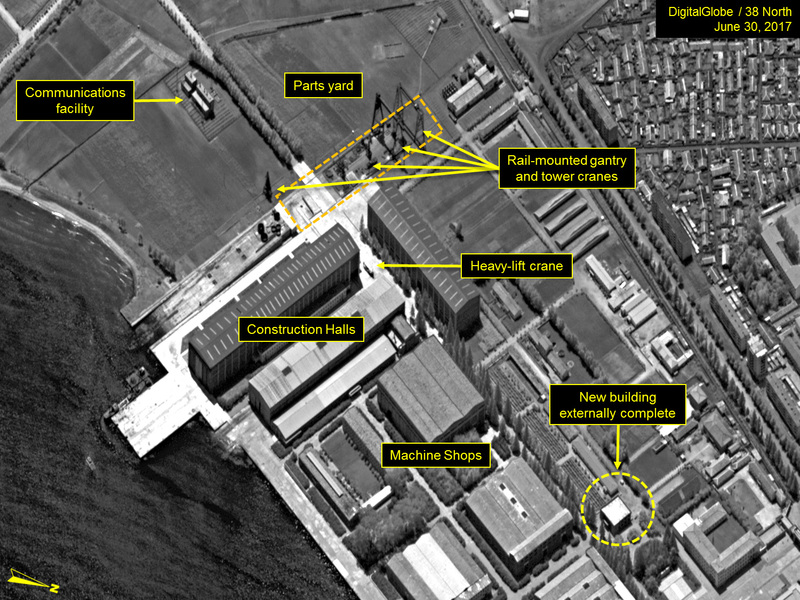 A number of potential reasons can explain this movement, including long-term preparations for a test of the Pukguksong-1, at-sea deployments of one or both craft during late-May, pre-deployment training and routine maintenance or a combination of these. Figure 1. SINPO-class SSBA and submersible test stand barge repositioned in the secure boat basin. Although North Korea has conducted 13 ballistic missile tests so far in 2017, including two of the Pukguksong-2 (KN-15) medium-range ballistic missile (MRBM), it is not known to have conducted any static or underway tests of the Pukguksong-1 since August 21, 2016. While the test launches of the Pukguksong-2 are undoubtedly of value to the Pukguksong-1 program, continued testing from a submarine is essential to bring a SLBM into service. Given the April 2017 acquisition of a second submersible test stand barge and other continuing ballistic missile activities and tests, it is likely that the North will have to conduct additional SLBM tests in the future in order to develop a viable weapon system. This test would likely be of an updated Pukguksong-1 or potentially a newer system. It is unclear how future SLBM testing and development will be divided between the submersible test stand barges at Sinpo and the new one presently at Nampo. It is conceivable that the North will use the second barge located on the west coast to test longer-range versions of the KN-11 by launching them from the West Sea over the peninsula to impact in the East Sea (Sea of Japan); this, however, remains to be seen. In order for the North to deploy a viable SLBM capability, it will not only have to complete development and testing of the KN-11 (or similar SLBM), but also build and put into service a new class of ballistic missile submarine (SSB) sometime within the next five years. While the movement of large parts in and out of the fabrication and construction halls at the Sinpo South Shipyard indicates that the North is building something, it is unknown if it is a SSB. While not necessarily conclusive, a preliminary imagery survey of east coast shipyards capable of building an SSB provides no indications of such construction. 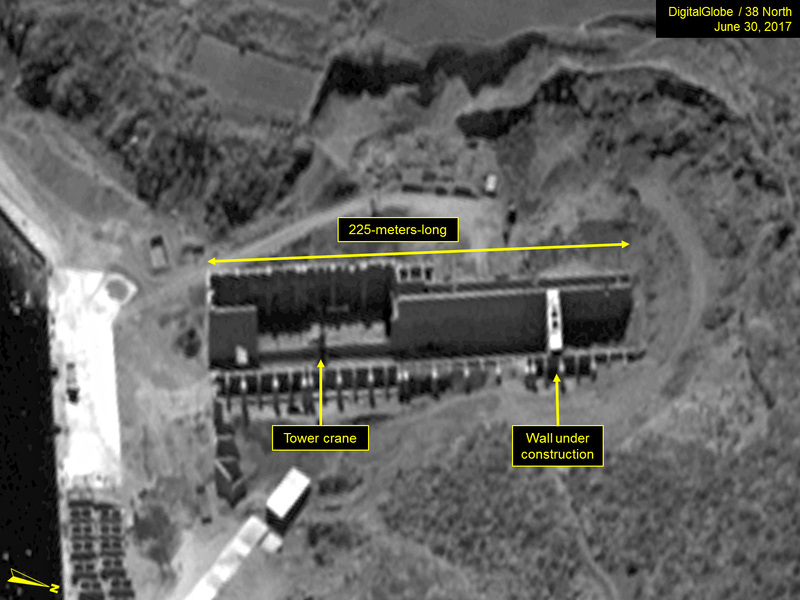 No new activity is noted at the static test stand used since 2014 for verification of Pukguksong-1 launch systems and pop-up and prototype testing. 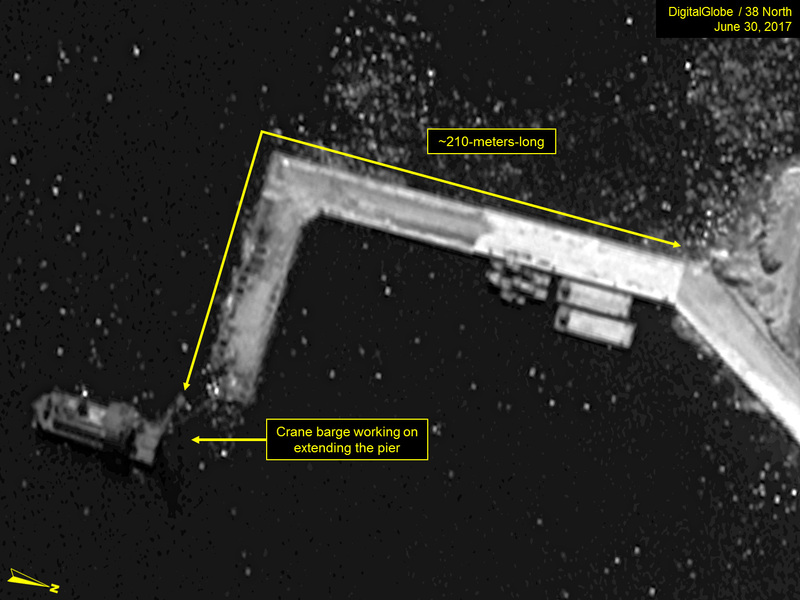 The heavy-lift crane and flat-bed truck noted during May are not present in the June 30 image and there is no evidence or reports of any testing since August 2016. The service tower, which until September 2015 was routinely disassembled and removed for testing, remains in place. Figure 2. No new activity observed at the test stand at Sinpo. The construction of a new building in the center of the shipyard begun in late-2016 appears to be externally complete in the latest image. A heavy-lift crane is present between the fabrication and construction halls and changing contents of the parts yard indicates that a construction program of unknown nature is being undertaken by the shipyard. No other changes of significance are noted at the facility. Figure 3. New building externally complete at shipyard. Construction, which began in 2012, of what appears to be a new construction hall on the southern tip of the Sinpo peninsula continues slowly. Approximately 225 meters long, the positioning and construction methods of the hall suggest that when complete it may be covered with earth to provide protection from possible attack. The associated L-shaped pier is now 210 meters long and caissons, for use in extending it, are visible at nearby docks. Figure 4. Construction continues slowly at new construction hall. Figure 5. Construction of L-shaped pier continues. It should also be noted that the port and associated facilities at Nopyong-ni, 800 meters west of the Sinpo South Shipyard and on the west side of the Sinpo peninsula, have been undergoing significant modernization and rebuilding since 2015. This has included the razing of a number of buildings, construction of a new building, refurbishing of other buildings and construction of a new seawall and T-head pier. Whether this is related to the development and fielding of a future SSB capability is unknown. Figure 6. Construction and modernization of facilities continue at Nopyong-ni. For example, see Conor Gaffey, “North Korea’s Next Missile Test Could be Launched from a Submarine,” Newsweek, July 20, 2017, http://www.newsweek.com/north-korea-missile-kim-jong-un-639420. While South Korean sources identify the submarine as a GORAE-class boat, the latest US sources identify it as a SINPO-class.